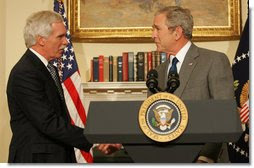 Yesterday President Bush announced the nomination of Ed Schafer to be the next Secretary of Agriculture. The Secretary of Agriculture heads a Cabinet department of more than 100,000 employees. The president said that Ed Schafer is the right choice to fill this post because he was a leader on agricultural issues during his eight years as the governor of North Dakota. The president said that in his new job, Ed will carry on the work of another fine public servant, Mike Johanns. The president also thanked Deputy Secretary of Agriculture Chuck Conner for serving as Acting Secretary during this time of transition.